Westover Hills Elementary: Glass Half Full? I’ll leave it to someone with more direct knowledge to assess the other effects of Ms. Loving’s outreach; I turn to the results on the VDOE Web site from the statewide testing program under the SOLs. 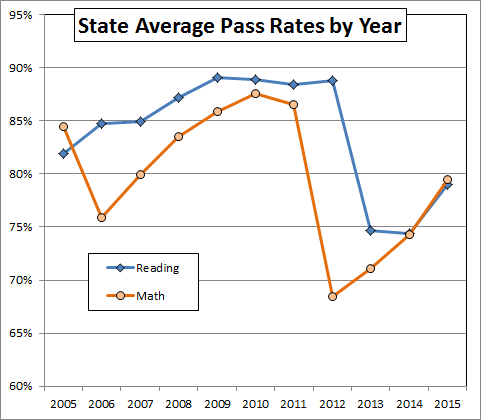 First, I should note that Principal Loving came in at a particularly difficult time: VDOE promulgated a new, tougher set of math tests in 2012 and reading tests in 2013 that clobbered the pass rates statewide (data here for all tested grades). Unfortunately, our former Superintendent did not prepare the Division for the new tests. The lack of preparation exacerbated the score drop here. 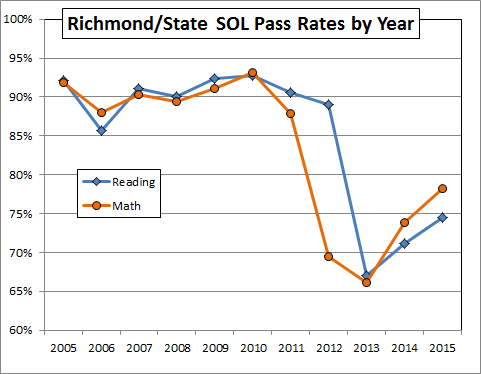 You might also recall that Richmond’s elementary schools on average perform ten points or more below the state average (but stratospherically above our middle schools). That said, the SOL performance at Westover Hills has been decidedly mixed. 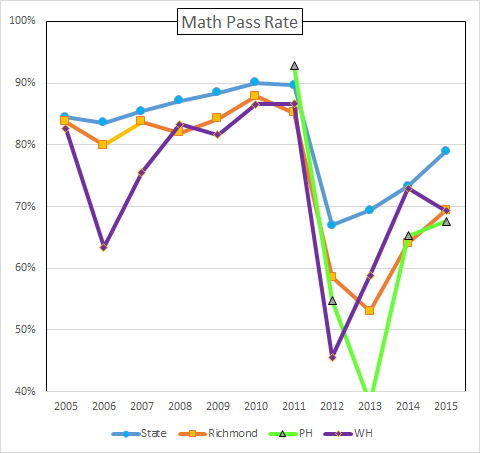 On the math tests, WH was scoring near the (unacceptable) Richmond average before 2012. The new tests hit even harder at WH than the at the district average. 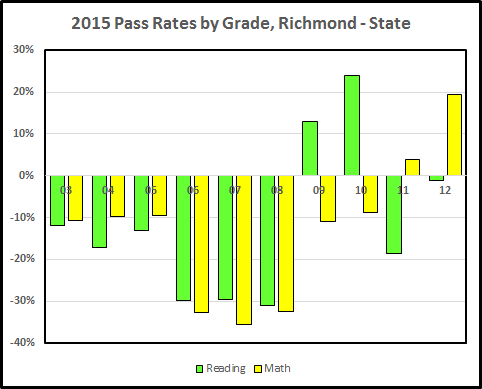 But WH recovered more quickly than the Richmond average (data for grades 3-5). 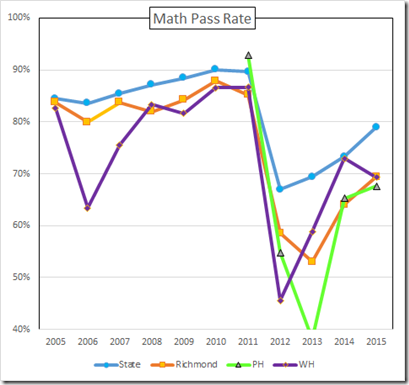 That is, under Principal Loving, WH took an unusually big hit from the new math tests but since has been showing signs of improvement. I’ve included the data for Patrick Henry, which is nearby and might be viewed as a neighborhood school. 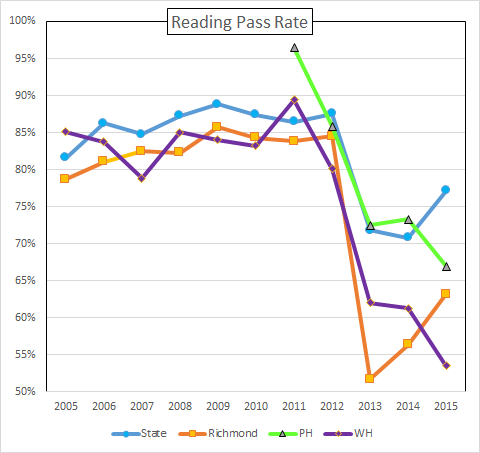 PH was hit even harder by the new tests and recovered only to about the (awful) Richmond average. The reading scores reveal a more troubled situation. 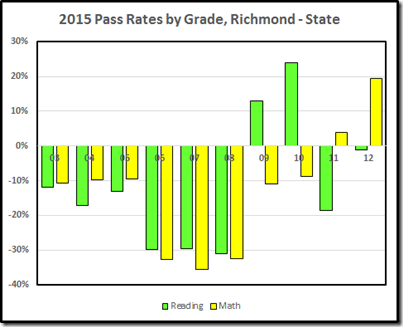 WH again was performing at about the Richmond average. 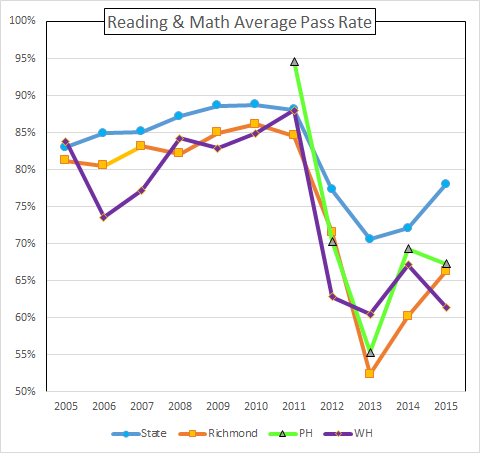 After the new test plunge in 2013, Richmond scores improved but the WH scores continued to decline. This is not good news for the school or for the children who attend it. (Again, data for grades 3-5). 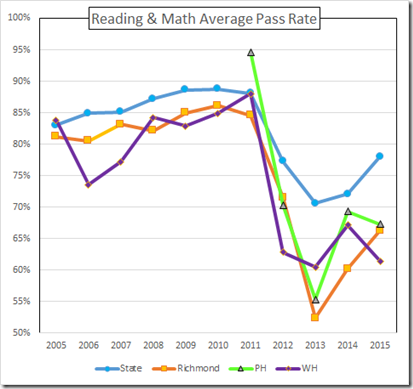 Patrick Henry started higher and dropped to the state average, but then continued also to drop. 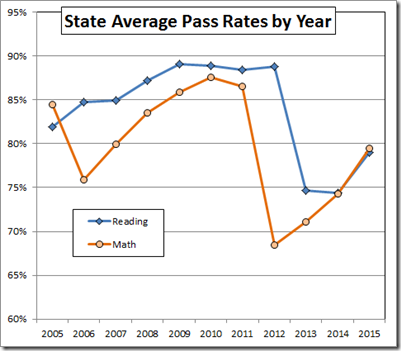 For what they may communicate, here are the combined (reading + math) pass rates. Seems to me the neighborhood outreach could be more effective if the teaching, especially of reading, were improved. Of course, VDOE has been obtaining SGP data that would tell us which of the Westover Hills teachers are, or are not, effective, so Principal Loving (and the neighborhood) would have data that directly measure teacher performance. Unfortunately, VODE is concealing the data they already have and now is abandoning the SGP entirely. 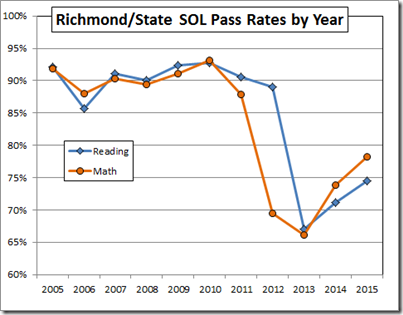 This is fully consistent with VDOE’s actual function, which is to be the Department of Data Suppression.